Who inspires you to be a Supergirl? Do you have a friend or relative that you look up to that displays what a true Supergirl is? Share her story in 500 words or less. The most creative short essay will be selected and the winner will receive a Luv Surf Gift Bag and the person nominated will be mailed a Paul Mitchell Gift Bag! Contest Description: This contest is a creative writing contest that requires participants to submit a short essay (no longer than 500 words). The winner will be selected based off of creativity and effort put forth. The winner will be mailed a Luv Surf Gift Bag full of Luv Surf Swag. The nominated Supergirl will be mailed a Paul Mitchell Gift Bag full of Paul Mitchell products! Timing: The contest begins on Thursday, June 18th and ends on Wednesday, July 8th at 11:59PM EST. To enter you must include contact information with your essay submission. Include your first name, phone number, email address, and age (must be 14 or older). All Entries must be received by the deadline – July 8th, 2015 at 11:59 p.m. The essay must be posted in the comments section of the Super Girl Pro blog (below this post). The likelihood of winning depends on creativity and effort. There is a limit of one (1) entry during the contest period. Winner will be announced on Monday, July 13th, 2015 and contacted via phone or email by July 9th. The winning essay will be reposted to the Supergirl Pro Blog. Entry Submission Requirements and Eligibility: No purchase necessary to enter. The Contest is open only to legal residents of the forty eight (48) contiguous United States (including the District of Columbia) excluding Alaska and Hawaii, who are fourteen years of age or older. Only one essay may be submitted for entry. Essays must be original content. You must include an email address and phone number with submission. The submission must be in English and no longer than 500 words. Any Entrant who is considered a minor in their State of residence must have their parent or legal guardian’s permission to enter this Contest. ASA Entertainment reserves the right to verify an individual’s eligibility to participate in the contest. Eligibility for winning is contingent upon fulfilling all requirements set forth. ASA has the right to determine winner. 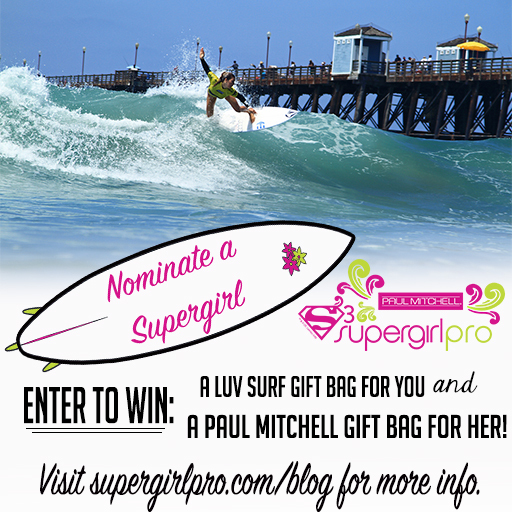 Prize: The writer of the winning essay will receive a Luv Surf Gift Bag and the nominated Supergirl will receive a Paul Mitchell Gift Bag! Winner Notification: The winner will be notified via phone or email, once selected. The winning essay will be published to the Supergirl Pro Blog. The winner has 3 days to respond and claim prize. The prize will be mailed after it has been claimed by the winner.